Serving the best gourmet Italian Ice Cream Catering in the San Francisco Bay ~ We are The Bay Area’s #1 Dessert Caterer!!! 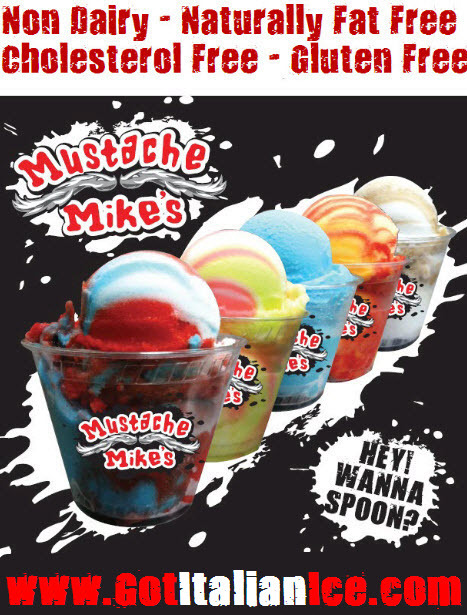 Established in 2011, Mustache Mike’s is a family-owned and operated Frozen Dessert caterer that serves a frozen delicacy that’s silky smooth, creamy and delicious. You’ll swear it’s ice cream! Our Italian Ices are made from sophisticated ice cream machines that were imported directly from Italy along with using only the finest ingredients and a 100 year old secret recipe to give our Ice Cream catering San Francisco Bay Area dessert customers over 150 unique flavors of the smoothest, creamiest Italian Ice available anywhere. We’re available for community events and we can also provide Bay Area Italian Ice Cream Catering services with our multiple Ice Cream catering carts & trucks.